Because I have already expressed my love for tacos to you, I will spare you from having to listen to it again. But, I do want to take a minute to talk about these tacos. This recipe was specifically developed to fit with the concept of the cookbook. I wanted to have another recipe to be able to use up the tasty Corn Salsa. When you prepare one recipe, there is always enough for two different dishes, so with the addition of a few other ingredients you can create another quick dish for lunch or dinner. Prepare the Corn Salsa and set aside. Jalapeño ranch: To prepare the dressing, seed, chop the jalapeño very fine, and stir into the ranch dressing with a pinch of salt. If you would like, blend the jalapeño into the ranch with a food processor, but it is not necessary. Set aside. Prepare the romaine and the cilantro. In a large skillet pan, heat 1 tablespoon of oil over a medium-high heat and cook the half of the shrimp with 1 teaspoon of taco seasoning and a pinch of salt. Cook the shrimp for about 2 minutes until the shrimp starts to form a U shape. Transfer to a bowl and repeat this step with the remaining shrimp. Set aside. In a small pan, heat the tortillas one at a time, 1–2 minutes on each side over a medium heat until they start to brown slightly. 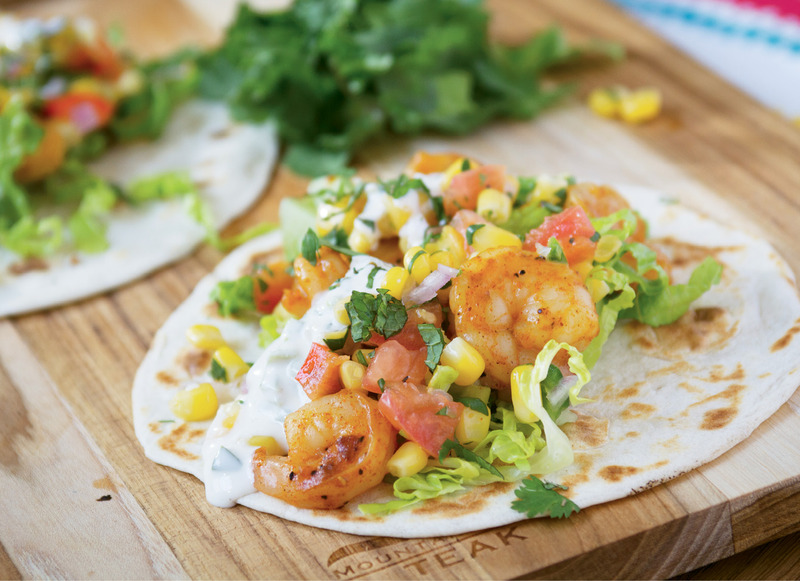 To assemble tacos, place the tortillas on the plate, add chopped romaine, 4–5 shrimp, and the desired amount of cilantro, Jalapeño Ranch and Corn Salsa.